Below are some of the projects that I have worked on in the past. 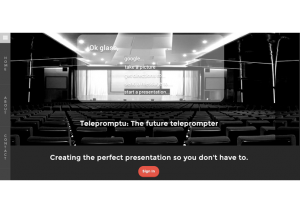 What is that: Telepromptu is real-time teleprompter built for Google Glass. The application integrates seamlessly with Google Drive Presentations, downloading presentation notes over the Internet to provide you with a scrolling prompt on your Glass display. As you speak, the teleprompter will scroll automatically and the system will automatically advance to the next slide on the presentation when you reach the end of the prompt for any given slide. 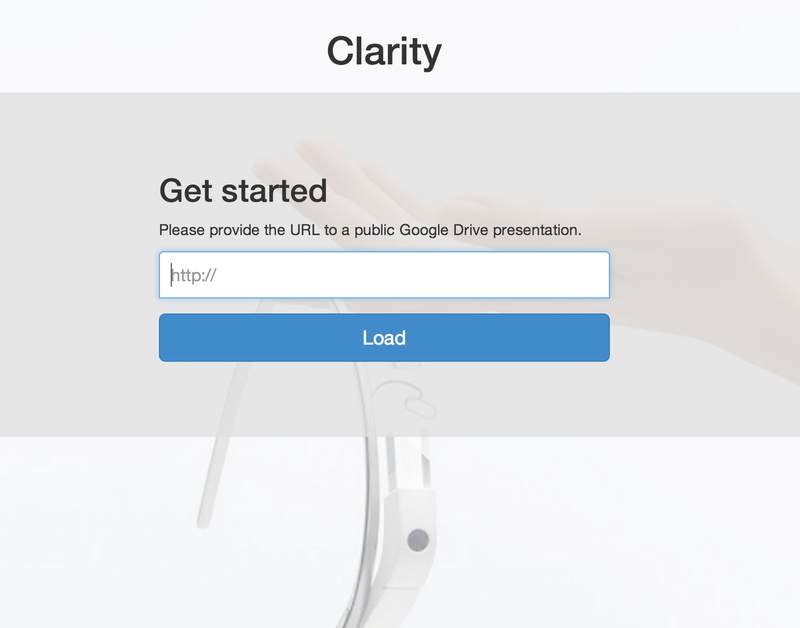 What is that: Clarity is a web application that lets you conduct a presentation through Google Glass. Users simply enter a Google Drive presentation link into our website and click load. The website then generates a QR code that is scanned into Google Glass. This lets the presenter see the current and next slide. The Glass application lets the presenter navigate through the slides through the flick forward / backward gesture on Google Glass. The slide shown on the presenter laptop is the same slide that the Glass application is navigated to. It also shows a running timer of the presentation and lets you toggle between the slide and presentation notes. Future enhancements would include presentation feedback such as eye contact distribution, frequency of stop words, nervousness, crowd reaction (laughter, silence, etc.) and a live teleprompter. Why: I would personally find this very useful. Also, I bought Google Glass to make apps for it and hadn’t gotten to it yet. What is that: Townfloor is a web application that lets audience at town hall style meetings ask questions by using their smartphone as a microphone. 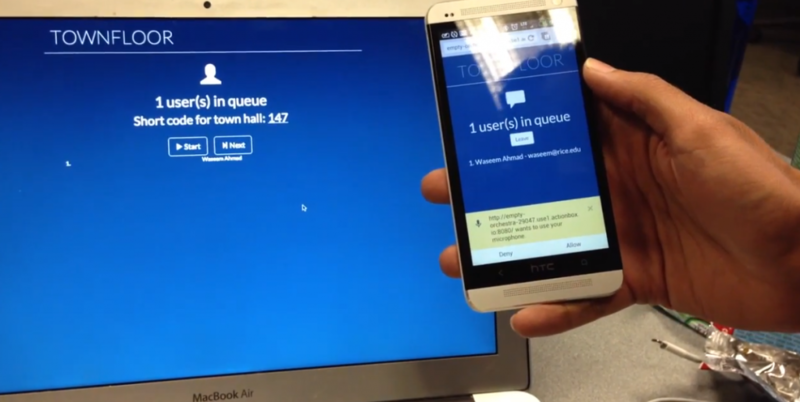 Audience members simply enter a short code into the application to queue in. Speakers can then interactively manage the queue of audience questions, pausing and skipping over them in real time. This application alleviates the need of bringing a microphone to the audience. 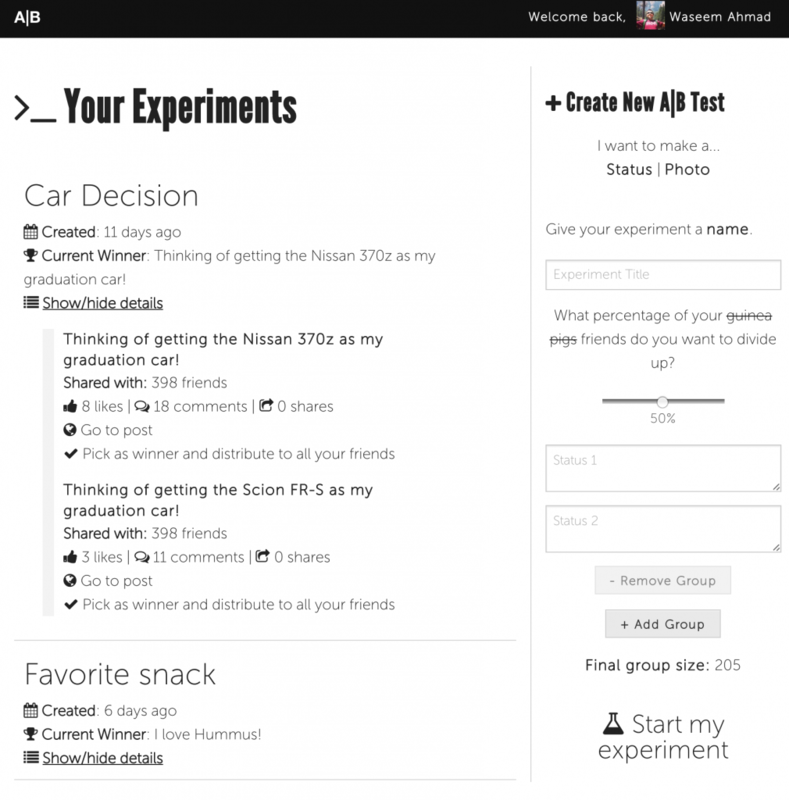 What is that: It is a website where you can a/b test your life decisions on your friends. You post two versions of a status message or photo to two different groups of your friends and you can see how many likes or comments you get. Then, when you’ve decided which one is better, you can post that version to all of your friends. Why: Because we spent 5 hours trying to come up with a better idea and we couldn’t. This was the funniest thing we thought of and people seemed to really like it. During my internship at Facebook, I created an internal tool that allows Payment Ops to achieve higher payment completions, utilize payment providers more effectively, and generate more revenue. allows split routing of trafﬁc to payment providers for individual methods. Using PHP / Hack, JS, HTML, and CSS, designed and implemented the UI for ordering and routing data entry, validation, and persistence. Implemented the business and routing logic for mobile alternative paymentmethods (non-mobile already implemented). 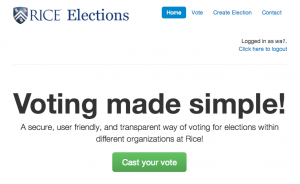 Allows organization admins to create elections with a specified voting period, and privacy settings. Voters are verified using Rice’s NetID authentication system so that voting can be conducted securely with the minimum number of steps. Elections can be restricted to a list of specified NetIDs so that student clubs, residential colleges, and other organizations can restrict election voting to their members. The ballots cast are not tied to the voters for privacy and anonymity. Supports the two most popular voting systems: Instant Runoff Voting, Cumulative Choice Voting. Automatically computes election results at the end of elections and makes them publicly available. Emails election administrators a detailed report with ballot information for manual verification. During my summer 2012 internship at Google, I worked on the QPX QA team. QPX is the flight search engine that powers Google Flight Search, Kayak, Hipmunk, Orbitz, and money others. Designed and deployed QPX dashboard, which integrates and consolidates data from test systems into a user friendly and interactive report. Optimized and parallelized QPX testing server startup scripts, speedup greater than 2x achieved. In an effort to simplify and streamline the process of placing content on the website of my residential college, I created a new website and integrated a content management system. I wanted the executive cabinet and various functioning committees of our college to have the power to place content on the website themselves. Therefore, I rigorously searched for a system and set of modules that were easy to use yet powerful enough for our needs. Check out the website at brown.rice.edu. During Summer 2011, I worked with a team at Auburn University as a research intern to explore different methods for collision avoidance for a number of UAVS specified a series of ordered waypoints to follow in limited airspace. To learn more about our findings, visit our team website at pfduav.com.